The Manhattan-Ogden USD 383 Board of Education was presented the special education program annual report during their meeting on Wednesday. Board Member Katrina Lewison asked Executive Director Dr. Deb Howser about the total number of students in the program. Howser said the report shows an increase of 63 students from last year. The total number of students this year is 1,129, making up 16% of the student population. Howser said their biggest priority right now is recruiting and hiring appropriately trained staff. Right now they have six positions to fill, but have only received two applications. Not all of their current staff is trained in special education. She said they have 11 staff members now who are currently “waivered.” This means they have a general teaching license, but no special education training. The department can connect a teacher to a university of their choice for training for that license, but says the cost is another barrier to entry. Prices vary at different universities, but fall around the $1,200 mark. Board Member Dave Colburn was glad to see the increase and the change in view society has on special needs students. He recalled his days in school seeing the students being brought in on the and hearing other kids say “horrible, mean things” about them. The good news with the increase of students, according to Assistant Superintendent Eric Reid, is due to the quality of the program. He says he has received countless phone calls of parents in other districts trying to get their kids in their program. They have heard the resources the district has that others don’t. 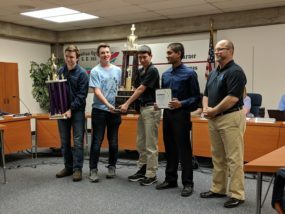 Also during the meeting, four Manhattan High School students were recognized for winning the 6A team title at the Kansas Scholastic Chess Association state tournament in March. The team comprised of seniors Jack Easton, Greg Chikan, Parajit Mondal, and Junior Jacob Grace. Individually, Senior Jack Seaton won the overall individual title 6-0. He finished his career unbeaten at 64 wins and 4 draws and a three time state champ. Parajit placed 21st at 4-2, Greg placed 31st at 4-2, and Jacob placed 45th at 4-2.